You simply cannot visit Cologne without paying homage to its most notorious site, the Gothic masterpiece that serves as the city’s cathedral. A local expert will show you favorite haunts around the Old Town, introduce you to the famous local brew, and share some of the cathedral’s most intriguing and Magi-cal secrets with you.Cologne is the largest and oldest city of the Rhineland and a cultural mecca, with more than 30 museums and hundreds of art galleries. A congenial atmosphere and a mix of ancient, modern and reconstructed buildings characterize the heart of the city. Experience Germany’s fabled Rheingau in one of two ways today. Take in spectacular views of the region’s famous vineyards from the perspective of an aerial cable car, or venture within an atmospheric medieval monastery and taste the Rieslings made on site.Like many cities along the Rhine, Rüdesheim has a lengthy history that stretches back to Roman times. These days, the town is best known for its narrow avenue of shops and wine bars called the Drosselgasse and its impressive Niederwald Monument. Later in the day, you’ll experience the most spectacular scenery on the Rhine. Frankfurt is known as the “Mainhattan” of Europe due to its profusion of bankers and soaring skyscrapers, which co-exist with the city’s traditional Old Town architecture. Experience Frankfurt’s many contrasts today by visiting Germany’s oldest museum or taking a guided “Go Active” bike ride.Delve into exciting Frankfurt today. A major European financial and trade center, vibrant Frankfurt boasts world-class museums, soaring skyscrapers, cozy wine taverns and lovely parks. Choose a brief tour that gives you an overview or a more in-depth walking tour and then explore on your own. There’s a lot to discover, including a great bike path along the Main, if you’d like to get out and about for some exercise. After today, you may never eat a pretzel again without thinking of the Bavarian town of Wertheim. You’ll meet one of Germany’s best pretzel makers here, as well as the owner of a historic wine estate, followed by a guided vineyard hike. Or, if you’re more in the mood for a scenic bike ride, you are perfectly welcome to do that instead.Your port of call today, Wertheim, nestles at the confluence of the Main and Tauber rivers; it’s a picturesque and friendly town dominated by the ruins of a 13th-century castle. Opulent palace or medieval castle? Whichever you decide to visit today, rest assured it will be completely enchanting. The Würzburg Residence is a 300-room palace with a famous staircase and a gigantic ceiling fresco (even larger than the Sistine Chapel’s).Your ship will dock in the delightful Franconian town of Würzburg, where you will visit the extraordinary Würzburg Residence—one of the most opulent baroque palaces in Europe. Step into a fairytale version of the Middle Ages in Rothenburg and visit a medieval castle that’s been described as a miniature Versailles.Spend a relaxing day onboard as your ship wends its way along the Main River between Würzburg and Bamberg. 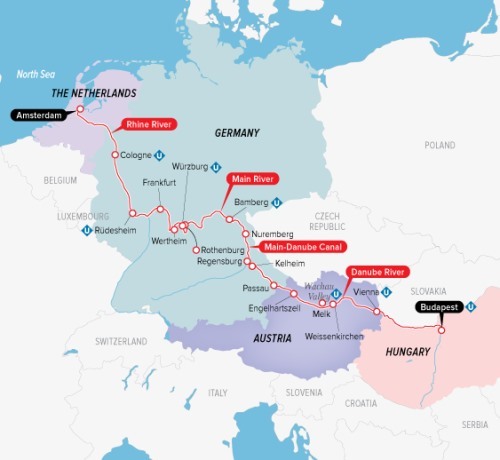 It’s something of a truism to say that this route takes you from wine to beer, and you’ll see the transition as you sail past the vineyard-covered slopes around Würzburg toward Bavaria’s famous beer-brewing center, Bamberg. Along the way, you’ll pass delightful little villages and romantic castle ruins, drift under lovely old bridges, and have plenty of time to observe the fascinating variety of vessels plying the river, from heavily loaded barges to jaunty little pleasure craft. Your floating time machine takes you to Bamberg today, a well-preserved town that offers a fascinating glimpse of medieval times. Explore the city on foot or opt to head deeper into the Franconian countryside to experience an authentic slice of rural life—including a tractor ride!Today, your ship will dock in the UNESCO World Heritage city of Bamberg, which has one of the largest intact medieval town centers in Europe. Like Rome, the city is built on seven hills—but in Bamberg, a church tops each one. During the Middle Ages, Bamberg was split in two, divided by the Regnitz River, one side controlled by the prince-bishop and the other by the burghers (a formally de ned class in medieval Germany). As a result of this division, the Old Town Hall was built on a tiny island in the middle of the Regnitz to serve both sides of town. Marvel at this medieval city’s striking architecture and stirring history on a walking tour through Bamberg’s Old Town. Or leave the city behind for an experience of Franconian rural life with a visit to a charming village in the verdant hills just outside of town. Head up to the top deck or find a seat with a good view—you won’t want to miss seeing the ship navigate its way through a marvel of modern engineering, the Main-Danube Canal. Your destination today is the historic city of Nuremberg, which you can explore in two different ways.Your ship docks in Nuremberg. One of Germany’s leading cities for many centuries, Nuremberg’s glowing heritage as a center of German arts, culture and economy was, sadly, also responsible for its disastrous experience in the 1930s and 1940s. Which aspect do you wish to explore? You must choose between two very different but equally fascinating excursions. Today in Regensburg you have four (!) options for experiencing this medieval gem of a city—select one for the morning and another for the afternoon. You can travel through time, get a crash course on making craft beer, watch high-tech robots assemble the Ultimate Driving Machine or enjoy a bird’s-eye view of the town.Regensburg is a friendly town with quaint cobblestone streets, historic Roman ruins and a UNESCO World Heritage–designated medieval city center. This unspoiled gem was the capital of Bavaria for about 700 years, from the 6th to the 13th centuries. The remnants of Regensburg’s golden age are still on display, particularly in the Stone Bridge, the first bridge to span the Danube, built in the 12th century. This bridge, which is 1,014 feet (309 meters) long, was an architectural wonder in its day. But don’t let Regensburg’s illustrious history fool you into thinking the town’s best days are all in the past. Modern Regensburg is a popular center of higher learning, with more than 30,000 students attending its various colleges and universities. In fact, Pope Benedict XVI was a professor of theology at the University of Regensburg until 1977. Regensburg also frequently appears on lists ranking the world’s best places to live, thanks to its outdoor spaces, historic city center, lively cultural and nightlife scenes, and great shopping. Passau is a crossroads in more ways than one—three rivers meet here and three nations nearly do, making for a fascinating cultural mosaic. Get to know the town with a choice of guided walks or “Go Active” with an invigorating riverside bike ride.Located at the confluence of three rivers—the Danube, Inn and Ilz—Passau is well known for its ornate baroque cathedral. Long ago, it was a Roman colony in the province of Noricum, called Batavis after an ancient Germanic tribe. Today, the city is unusually well preserved, having been spared the brunt of Allied bombing during WWII, as you’ll see on your walking tour of Passau. If you’d like some active touring, join us for a guided bike ride along the Danube. Vienna is a cultural treasure trove revered for its art and music (and sinfully rich pastries). Experience the City of Waltzes with your choice of excursions, as well as VIP access to an extraordinary collection of art—having an opportunity to see these masterpieces in complete privacy is an extra special treat reserved solely for Uniworld guests. And to cap off a perfect Viennese day? An evening concert featuring works by Mozart and Strauss.The grand dame of the Danube, Vienna was the heart of the Austro-Hungarian Empire and remains, to this day, the political and cultural center of Austria. Klimt painted here; Beethoven and Mozart composed here; Freud developed his theories here. It’s a treasure trove of splendid architecture, astonishing art collections and inviting cafés—and it’s yours to enjoy.To begin your exploration of this delightful and historic city you may choose between two different guided tours: a panoramic city tour or our exclusive “Do as the Locals Do” walking tour. Another highlight today—our exclusive “Morning with the Masters” at the Vienna Art History Museum. Later, you can discover the endless charms of Vienna at your leisure. Located on opposite sides of the Danube, Buda and Pest each has its own distinctive character and charm. Get acquainted this dynamic and multi-faceted city with your choice of excursions—whether you see it on four wheels or on your own two feet, there is much to discover in the Hungarian capital.Called the “Queen of the Danube,” in part because of the way the city hugs the banks of the river, Budapest is an enchanting city that vibrantly mixes East and West, medieval and modern. Made up of two parts—Buda (the hills) and Pest (the flatlands)—and divided by the Danube, Hungary’s capital presents an array of architectural styles that reveal its long and varied history. You’ll have two enticing ways to experience the city—a panoramic guided tour aboard a motorcoach, or discover the Budapest that locals love on a special walking tour. Disembark the ship. If your cruise package includes a group transfer or if you have purchased a private departure transfer, you will be transferred to Budapest Ferenc Liszt Airport for your flight home. Or you can extend your stay in beautiful Budapest with our exciting optional post-cruise extension. Prices exclude additional port charges of $360 per person.